Well, since becoming totally smitten by passionfruit while in Taiwan last October, I became dead-set on growing Passiflora incarnata. It also helps that it's the official wildflower of my home state, Tennessee. So I ordered 2 plants from Logee's - one white variety and one purple, so that I could save on shipping costs versus trying to get 2 genetically different plants from 2 different nurseries. The white maypop arrived about half the height of the purple, and it had 2 main shoots versus 1 on the purple. The purple tripled in height over the course of a few weeks, but the white one barely grew a couple inches (in the same conditions). Logee's is subsequently sending me a replacement - not holding my breath. My backup plan is to dig up a wild plant as soon as I can find one. I constructed a trellis based on recommendations in my post "Passionfruit Trellis Ideas." It consists of 2 metal posts about 6-7 feet apart and galvanized wires running across, one at about 2 feet from the ground, and the second at about 4 feet. 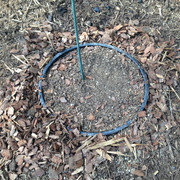 I did not want the vines to spread all over my yard, so I dug 2 holes about 12 inches in diameter and 10-12 inches deep. I got 2 plastic straight-sided grower pots, cut the bottoms out, and put them in the holes with hopes that it would contain the runners. I tried to just backfill with native soil, but it was difficult to work with - pretty heavy clay. So I found a decomposed tree that had disintegrated into peat moss-like loose compost, mixed with actual compost of my own, and maybe some other junk, and planted the vines in that. Within a day or 2, something had nibbled the topmost leaves off the white maypop. And just this morning I discovered that something had rooted around quite aggressively and essentially destroyed the white vine. So good thing Logee's is sending me a replacement anyway! My next step is to decide the best way to protect the plants. Thinking of hardware cloth or chicken wire on the ground around them to prevent digging, and/or a chicken wire fence around the entire area. I've trapped 3 possums in a week so far...thinking they will be having a field day on any fruit I am able to get. Any and all advice is welcome! I haven't checked out their website to see what the species are that you ordered but I don't think they are P. incarnata nor are they winter hardy. I grow both P. edulis and P. incarnata in my garden (zone 7b Raleigh NC). Edulis are the purple fruited type and they are kept in pots and moved into the greenhouse for the winter. After 3 years they are finally large enough to fruit which they have this spring for the first time ever. The incarnatas were originally planted in one spot but they now have taken over the yard and pop up in just about every environment. I only weed them out of flowerbeds where they will pose a problem because I like having them around. There are wild incarnatas (Maypops) in the woods around the house but I have never found fruit on them. The one I grow came from seed I collected in the wild in Arkansas at a highway rest area. I noticed the vines were short (maybe 6 feet) and had been covered with fruit (maybe a dozen on each vine). The ones growing in my garden are still somewhat short for a passionvine and produce more than enough fruit for me to eat. The fruit only has that intense tropical flavor if it is dead ripe and falls off the plant. The seeds have to be black and the outside wrinkly otherwise it has no flavor. Even when people visit from South America and they are touring my garden, they agree that the fruit of these vines taste very similar to the purple fruited ones back home. I love these plants but most folks think the fruit looks too much like frog's eggs to eat it. Those that I can convince to taste it love it also. I'm not sure how long it will take the purple ones to ripen but I am definitely moving them up to larger pots in hopes that it will mean more fruit. Interesting that you're growing edulis! I'm not sure I have enough room in the house to overwinter any more plants, so I plan to stick with incarnata for now. I have found very quickly that rabbits love these things. I knew I should've done it sooner but i just now put a chicken wire cylinder around the vine. Rabbits nearly sheared the thing in half. I put a splint made from toothpicks on the stem to see if it will grow back together. So far it appears that it may be working. My replacement white maypop is scheduled to arrive today. Now my concern is protecting ripe fruit from possums, of which I have plenty. I may have to build a cage around the entire thing. TriangleJohn - how do you protect your passionfruits from varmints? I also plan to look for wild vines to potentially transplant. Friend told me he successfully did so as a kid. I actually haven't seen many of these in the wild but haven't looked too hard either. One vine in our church parking lot actually set 3-4 fruit last summer but didn't get to taste them. They may not have ripened properly either. I have seen some good producing incarnatas in the brush in Rutherford county but that was years ago. Don shadow has some at Shadow nursery , in Winchester, that are quite prolific. He has a bunch planted right at the entrance, very beautiful flowers. I'm from Winchester...I need to get down and pay ol' Don a visit! I would love to say that my two Rat Terriers help out with the varmit control but they are lazy bums and prefer to sleep at night, in my bed, under the blankets! rather than patrol the garden. So far opossums and raccoons have not been a big problem. All I ever see are young ones and everyone seems to prefer the compost pile rather than the fruit. I'm sure that will change as more of the collection gets to fruiting age. In general I have a "show no mercy" policy about any animals coming into my garden or chicken house. I live on the edge of the city and had more wildlife bothering my garden when I lived downtown. My neighborhood doesn't have trash pickup so everyone hauls their trash to a station at the end of the street and I think that it is the lack of human trash that keeps the wildlife numbers low. Deer are another problem but I installed an 8 foot welded wire fence around the entire 1.5 acres and they don't even try to get in anymore. Well, the top half of my purple maypop in the ground did not survive the rabbit attack. It started pushing new growth below the cut, so I just cut the top part off. The most vigorous regrowth is from pretty low on the stem, so kind of annoying that it'll take that much longer to reach my trellis. Hard to tell in the picture but leaves kind of curled under and the entire plant rather limp. I watered it with a little KLN solution and it perked up slightly. A week later it does finally seem to be shaking the funk and growing. Hardening it off now and hope to have it in the ground in a week or so. Both maypops in the ground and doing well. Flowers forming on both vines. They have reached and slightly overtaken the first trellis wire. Something has eaten holes in some of the leaves. No sign of the culprit yet. ive never heard of a white incarnata ? just saw it on Logees website. i would love to have a cutting once you get going. I have 3 purple ones at least 2 are clones of each other, maybe all 3.
and time to ripen, its late fall. with a 5ft pole for them to climb. my large plant had 50ft of vines at least the first year and never fruited. i rarely get fruit unless the vine is 3yrs old, or, the root system is contained. for the one in ground. the fruit takes a while to ripen. dont pick, unless it falls off, or comes off with a light touch. i just use a plastic bag around the fruit and piece of string to tie it. The only thing i have to worry about, are squirrels and rats though. i'd be happy to send you a cutting at some point. I have 2 fruits forming on the white vine, but the purple vine seems to be using most of its energy for foliar growth. It's only produced a couple of blooms versus 6 or so on the white vine. 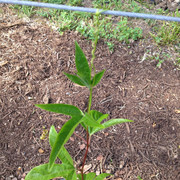 However, the purple vine has a dozen or more buds, they just seem to be developing slowly. This could be due to the fact that somehow the vine was severed about 2 feet above ground a few weeks ago (this is actually the second time this vine got hacked - the first was by a varmint). So it's now branched laterally along the first wire, and the vertical leader has now reached the top wire. About a week ago I top-dressed the vines with a layer of homemade compost and cow manure. I may have to expand my trellis - looks like they're going to overtake it. Coincidentally I was recently spraying some Roundup in a spot near these vines. As I was surveying the area a few days later, to my surprise and dismay, I spotted 2 wild maypop vines among the weeds. DRAT! they took a hit for sure but don't seem to be dead. They may be done for this season, though. At this point across my 2 vines, I have a total of 4 fruits set - 3 on the white vine and one on the Purple. I was really excited a few weeks ago when it seemed like every flower was being pollinated (by bees, not me). But since then, I've had dismal fruit set. The flowers are constantly visited by bumble bees but I'm still not getting fruit set. I have also hand- cross-pollinated a few and still no luck. Do maypops (or passiflora in general) have a "self-sterility" switch that somehow they flip to prevent additional fruit set, if it thinks it can't support it? or maybe because these are young vines (just put them in the ground in May), they are not capable of a high fruit set? 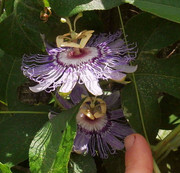 "Maypop flowers need cross-pollination to set fruit, but even when pollinated, not all flowers will set fruit. That's because on every plant some flowers, although having male and female parts, are functionally male. Functional males are so either because their female parts are held upwards out of the way of insect visitors or because they have atrophied. 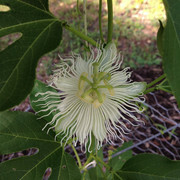 Throughout the season, a maypop plant adjusts the types of flowers it has according to growing conditions. As more fruits set or light becomes limited, fewer perfect flowers are produced. An increasing percentage of flowers are male as the season progresses, unless no fruits have set already." Frustrating but so biologically awesome. The book also contends that hand-pollination produces "highest quality" fruits and results in at best 50% fruit set. Pretty impressed with that book based on this useful information. I have most of Lee Reich's books - I'll have to look for that chapter. At this point of the summer I have fruit on three types of passionvines in my garden. The P. edulis (purple fruit, grown from seed) has a couple of fruit, one of which has ripened and had a nice rich flavor. The P. incarnata that I mentioned earlier is in full bloom and I see fruits forming. And surprise surprise a small potted 'Lady Margaret' hybrid (Passiflora incarnata crossed with Passiflora coccinea) has one small fruit on it. All are supposed to be edible so I will taste and see how they are. After reading your comments on container growing versus in the ground - I think I am going to set up an area in the garden to sink large pots for my wild collected P. incarnata's. I need a way to make harvesting the fruit easier so some sort of trellis with the plants in large sunken pots should work. Out of all of them that I grow these guys have the best flavor. Interesting on the reduced good flowers late in the season. I wonder if there were actual recorded trials for this. Not that I have any better information. I think I am going to set up an area in the garden to sink large pots for my wild collected P. incarnata's. I need a way to make harvesting the fruit easier so some sort of trellis with the plants in large sunken pots should work. Out of all of them that I grow these guys have the best flavor. Oh wow - your incarnata's have the best flavor of your Passiflora? That's encouraging! Yes - good luck with your experiment sinking pots. Time will tell how it works for me. I am now trying to figure out what "growing conditions" I have going on that may be contributing to the preponderance of "functionally male" flowers I am seeing. I spoke to one maypop grower who suggested maybe it was lack of water. But various internet sources i've read have mentioned maypop doesn't like overly moist conditions. Perhaps, however, I am overestimating the water retention of the soil. They are getting at least 6 hours of direct sun, I'd say. The presence of many flowers makes me think sun is not the issue. I've added, over time, a little 7-9-5 organic fertilizer, compost, manure, and mulch. The white vine has put on virtually no vegetative growth over the last 3 weeks (but it's supporting 3 fruits). The purple vine has doubled in linear area in the past month, but it's not going nuts either (the same grower I spoke with mentioned vines growing 30 feet in a season!). thanks for the info! I have tons of bees visiting the flowers but am way below 50% fruit set. Must be something making them unhappy (?) OR they are just too young. In my zone 7b garden the P. incarnata's have the best flavor and I have only the fruit from plants grown from wild collected seeds from one spot - all the native ones growing around my yard do not set fruit. When I have traveled in Latin America I have tasted really good passionfruit that was much much much richer in flavor. Parcha in Puerto Rico was really good and Maracuja in Ecuador was the best of the best. Even if I could keep those species alive here in Raleigh my experience with P. edulis leads me to think that the flavor would not be the same. It might be the soil. It might be the temperatures or the humidity. It could also be the long summer days (doesn't happen in the tropics) - who knows. I tend to think the reason they call them Maypop is because no matter where you plant them, in the future they "may pop" up over here or over there, there doesn't seem to be a reason where they show up. In my one acre garden they end up in just about every environment - sun or shade, dark rich soil or gravel or clay, wet or dry. They do best around my blueberries, for whatever that's worth. Triangle - how long have you noticed it taking for fruits to reach maturity? The Lee Reich book says 2-3 months. The fruits on my white vine have only been around about 3 weeks - 4 weeks tops - and they are starting to wrinkle and soften. I'm afraid these are dying, not ripening - or is Reich incorrect? I think they take a couple of months to ripen. I seem to remember September being the month I normally start eating them. Because my vines are growing all over the garden (which is full of long rows of various fruiting bushes) I don't always stay on top of the passion fruits. I usually see them lying on the ground when I mow the grass strips running between the rows. I did notice a few thumb tip sized fruits forming this weekend. I also think that they only seem to make fruit after the summer equinox. I think the fruits forming now take a while to ripen but the fruits formed later seem to ripen quicker so that everybody gets ripe by first frost in late October/early November. Makes sense.....i think mine were just wrinkling/softening due to the heat or something. I went out this morning and they were firm and taught. I do think one of them may be croaking, as it's started to change colors and has stopped growing. In your experience, how much water do these vines like? I can't tell if mine are getting too much or too little. They only seem to suffer our dry periods if they are out in full blazing hot sun. If they are growing around other bushes or in dappled light they never seem to have any problems with water. I have the P. edulis and the hybrids in pots and I know they sometimes dry out and I've never seen them wilt. I have 4 fruits right now but I am suspicious of 3 of them....they are darker in color and seem to be stunted. Not sure they will mature. I've never tasted an incarnata but others here have. I have seen widely variable reports as to their quality. I was surprised to recently read in Charles Boning's Florida's Best Fruiting Plants: "The fruit of the maypop is not simply edible, but is actually worth eating...It is highly recommended for planting in central and north Florida." Other sources say the fruit is sour or tart or only good as a juice with sugar. I have recently found several wild maypops in my area and have taken some cuttings that i'm trying to root. I also plan to dig some up. I want to try growing some indoors...not sure how that'll go or if they'll flower (would be in indirect light only). My parents scoop the pulp into a blender with some water and honey. The blender breaks the seeds and the meats float to the top, shells to the bottom. It's very good, but I don't remember how tart it was to eat out of the fruit. Less tart than edulis I think. Cool....I am on pins and needles waiting to taste one. I'm a little disappointed that mine have set so little fruit despite pretty profuse flowering and constant bee visits.